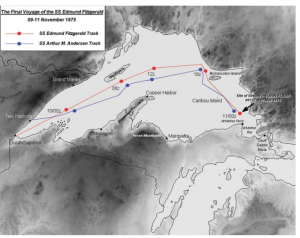 On November 10, 1975 the Great Lakes bulk cargo vessel SS Edmund Fitzgerald carrying a cargo of taconite pellets (iron-bearing flint-like rock used in steelmaking) sank with the loss of all 29 crewmembers in eastern Lake Superior about 17 miles from the entrance to Whitefish Bay, Michigan during a severe storm. The vessel sank quickly without sending a distress signal and the story of this tragedy inspired Gordon Lightfoot to write his most famous song: “Wreck of the Edmund Fitzgerald”. 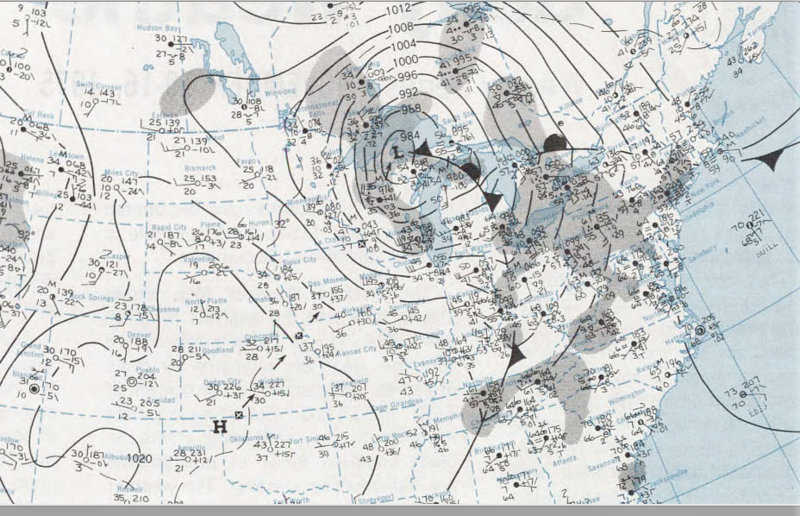 The day before the event, November 9th, an area of low pressure developed over the Southern Plains and moved northeastward and intensified to 1000mb by 1200Z on the 9th over Kansas and later to 993mb over Iowa (0000UTC on the 10th). A Gale warning was issued by the National Weather Service for Lake Superior at 1939UTC on the 9th. At 1915UTC on the 9th, the Edmund Fitzgerald departed from Superior, WI bound for Detroit. A short time later, the Arthur M. Anderson left Two Harbors, MN and was also headed eastbound. Both masters decided to take a northerly route to keep in the lee of the forecasted northerly gale winds. At first, the Arthur M. Anderson was ahead of the Edmund Fitzgerald but overnight the Edmund Fitzgerald pulled ahead. At 0700UTC on the 10th the National Weather Service issued a Storm Warning for Lake Superior as the now deepening low was moving northeastward reaching a position near Marquette, Michigan by 1200 UTC (982mb). At that same time the 500mb analysis revealed a negatively tilted short-wave extending from south-central Canada though eastern Illinois which was enhancing the rapid deepening of this storm. 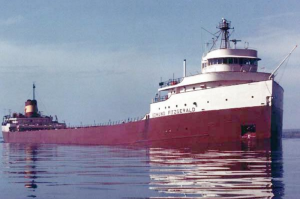 At 2030UTC on November 10th, the master of the Edmund Fitzgerald (Capt. McSorley) reported that a fence rail was down and that a couple of vents were lost and that the vessel was developing a list so he decided to reduce speed in order to allow the Arthur M Anderson to close the distance between them. Just 40 minutes later, Capt. McSorley reported that both of his radars were out of order and asked the master of the Arthur M Anderson if they could assist with navigation. 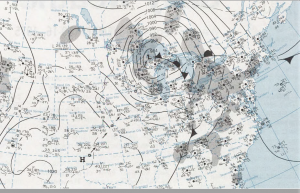 During the period between 1800 UTC November 10th and 0000 UTC November 11th the low moved northeast to near James Bay deepening to 978mb causing westerly to northwesterly winds to increase over Lake Superior. At 2139UTC the Coast Guard reported that the radio beacon at Whitefish Point was not functioning. Between 2200 and 2230 UTC Capt. McSorley reported that the vessel was now listing badly and that they were taking heavy seas over the deck. At 0010 UTC on the 11th, Capt. McSorley reported “We are holding our own” but this was the last message sent by the doomed vessel. 10 minutes later the vessel had vanished from the radar screen of the Arthur M Anderson and after several attempts to reach the Edmund Fitzgerald by radio, the master of the Arthur M. Anderson informed the U.S. Coast Guard that the Edmund Fitzgerald may have suffered a casualty. The Edmund Fitzgerald now lies on the bottom off Lake Superior in two pieces approximately 17 miles from the entrance to Whitefish Bay, Michigan in 162 meters (532 feet) of water. All 29 crew members aboard were lost with the ship. A reanalysis of this event was done in 2005 by NOAA, National Weather Service utilizing the Regional Atmospheric Modeling System (RAMS). The model run started at 0000 UTC 9 November 1975 and ran through 0600 UTC 11 November 1975. 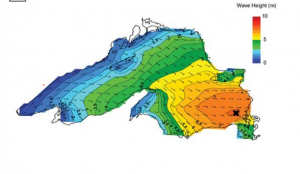 The analysis showed that at 2100 UTC on November 10th there were two cores of high wind over the Lake with one of them in excess of 45 knots and the second in excess of 40 knots. 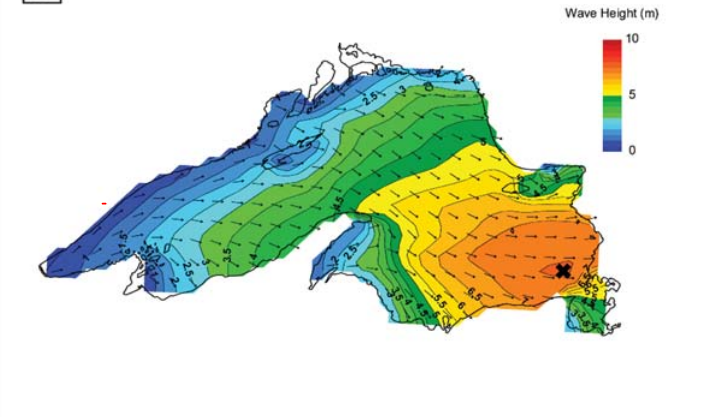 The highest winds occurred over the southeastern part of Lake Superior where the Edmond Fitzgerald was heading. Wave heights increased to near 6 meters and by 0000 UTC November 11th and winds were exceeding 45 knots over most of southeastern Lake Superior. The Edmund Fitzgerald sank at the eastern edge of the area of high wind where the long fetch (distance that the wind blows over water) produced significant wave heights (average of the highest 1/3 of waves) to over 7 meters (23 ft) by 0000 UTC and to over 7.5 meters (25 ft) at 0100 UTC with a maximum significant wave of 7.8 meters (26ft). Given a significant wave of 7.5 meters (25ft) about 1 in 100 waves could reach over 11 meters (36ft) and one out of 1000 waves could have been as high as 14 meters (46ft). Since the vessel was heading east-southeastward, the waves were quartering to following which resulted in heavy rolling. At the time of the sinking he Arthur M Anderson reported NW winds of 50 knots which matched the model output of 47 knots. The model showed that the maximum sustained winds occurred between 0000 and 0100 UTC at 60- 65 knots with gusts upwards of 75 knots. Just a couple hours later (0300 UTC) conditions had eased to under 45 knots. The National Transportation Safety Board determines that “the probable cause of this accident was the sudden massive flooding of the cargo hold due to the collapse of one or more hatch covers. Before the hatch covers collapsed, flooding into the ballast tanks and tunnel through topside damage and flooding into the cargo hold through non-weathertight hatch covers caused a reduction of freeboard and a list. The hydrostatic and hydrodynamic forces imposed on the hatch covers by heavy boarding seas at this reduced freeboard and with the list caused the hatch covers to collapse. This entry was posted in Weather History and tagged History, Ocean Weather. Bookmark the permalink.